Sods law determines I'm laid up with a bad back for the 5 days of spring tides. Still - must not grumble ( moan, moan ) must we. Anyway - glorious weather. Remove the compass from the bulkhead and fluid is pouring out of it - couldn't even post it off like that. So take off the back - can't resist the excuse to investigate ! The diaphram is essentially a soft clear plastic/silicone like disc that forms the entire seal, along with the back cover plate, of the rear of the compass body. It had a split in it about 25 mm long. I had gathered that these were filled with a Paraffin type fluid - so thought if maybe I could weld the split up, with a hot knife, it was easy enough to top it up. On the side is a simple filling plug with a generous sized hole. So that's what I did - and after about a hour had a repaired compass - not a single little bubble to be seen. A short lived success - it was leaking again a bit bt Sunday, but at least I can post it off reasonably full of fluid - which will protect it a bit. With the weather providing that rare, rare thing at Uphill - virtually no breeze - I took the chance to sort out the mainsail. Calm enough to get it up to the 2nd reef - so I could rig the reefing lines and tie in the sail ties. I've pondered how to tie these, but found that putting one through the eye one way, and the other the other, you can then tie half a double fishermans on either side of the eyelet - and pull them together. I've sorted out a system for raising the main from the cockpit - just to facilitate the initial hoist, when single handed. I'll sort out a sketch of this soon. 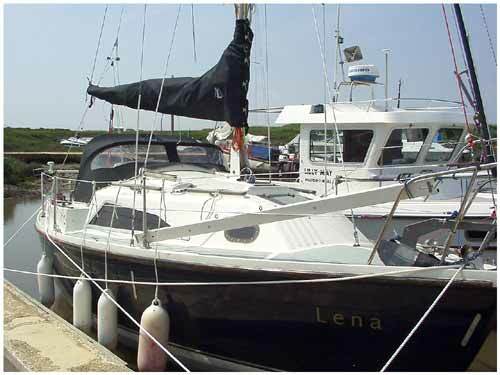 Basically, the external halyard comes down to an open sided fairlead and open camcleat, at head height on the mast. This is on a plate, arranged to be in line with a single turning block at the mast base. From there, there is a straight lead through under the sprayhood to the cockpit. The halyard is cleated only at the mast. When you go to the mast, you can either leave it in the camcleat, tying off to the mast horned cleat, or you can take it out of both the camcleat and, importantly, the fairlead. This fairlead was an addition, and had to be modified from a closed one - (basically it is a sort of hook, fairlead ) It was needed beacause when there is no load on the halyard, prior to hoisting the sail, it tended to catch the wind above the camcleat, enough to slip out the jaws. This depended on the topping lift being able to be released from the cockpit. I've made the boom end to go through an eye with a stopper knot - so I can set the lift up from either end, boom or at the mast. 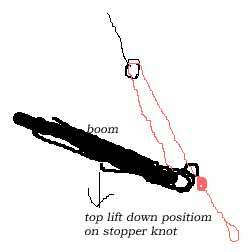 I am considering a short loop at the boom end to a single block at the end of the topping lift, with a stopper knot. 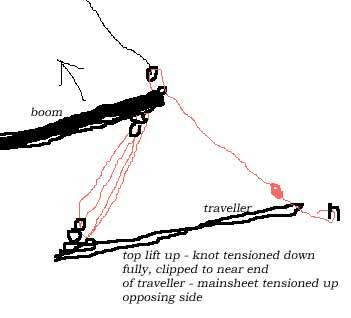 When the knotted end is pulled down, the boom raises and sets the lift on, it could then be clipped to near the end of the traveller - this gives you a bridle, if the mainsheet is run to the other end of the traveller - locking the boom in situ, and at the same time putting the topping lift on. You can then set a reef in at the mast, with the boom under control, adjust the halyard at the mast - then release the lift back in the cockpit. Does that all make sense ! Another possibility with the main halyard set up - is if you envisage wanting to drop the main quickly, single handed - then you could leave the halyard just in the camcleat, flip it out of the fairlead, pull it out of the block, leading the loose halyard back over the sprayhood, etc to the cockpit - where a quick tug outward would release it. This I will have to try out. Having said all that, the main seems to glide up with little effort - it's slugs, and they were all new when the main was refurbed with the third reef - so I think it will come down easily. Also - had the chance now to try my new mainsail cover I made, from the old pattern. Fitted very nicely - see pic above. Post off the compass tomorrow.